All events for Dads at Play! 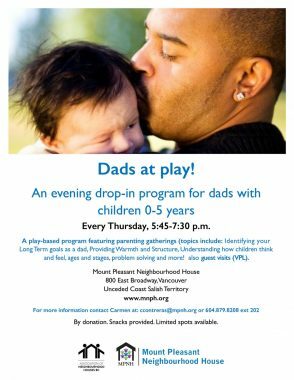 An evening drop-in program for dads with children 0-5 years A play-based program featuring parenting gatherings (topics include: Identifying your Long Term goals as a dad, Providing Warmth and Structure, Understanding how children think and feel, ages and stages, problem solving and more! also guest visits (VPL). By donation. Snacks provided. Limited spots available. For more information contact Carmen: ccontreras@mpnh.org 604.879.8208 ext 202 Share on Facebook!